MPlus Social Review 2018 | Is MPlus Social a Scam or Legit Forex Broker? Beware MPlus Social is a Non-Regulated broker. It is NOT SAFE to trade. 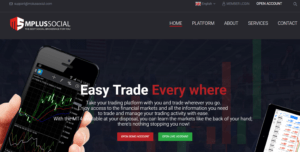 MPlus Social is an offshore broker that specializes in forex, CFDs, indices and commodities trading. It is owned and operated by MPlus Global, regulated by the Vanuatu Financial Services Commission (VFSC). The website states that the company’s liquidity providers are authorized and regulated by the Financial Conduct Authority, registered in the UK, but they don’t mention the names of the providers, which is quite suspicious. The broker doesn’t provide the address, there is a link to the map that shows Cyprus. Also, the contact phone number is Cyprian. We couldn’t find any information about MPlus Social licenses with any of the mentioned regulators. The website supports several languages (English, French and Italian). Usually, the supported languages show what countries are being targeted by the broker and it seems like MPlus Social is not regulated in any of those countries. Doing business with offshore brokers is extremely risky and it is highly recommended to avoid such companies and to select among brokers licensed by the respective authorities in the UK, or Australia for example. For instance, a broker registered with the UK’s FCA can’t simply take investor’s money and disappear. They follow multiple reporting procedures and have to keep client funds segregated from the company’s. They are also involved in the Financial Services Compensation Scheme (FSCS). It is a fund that works as an insurance company for the brokerage firms and their investments.